SCIENTIFIC NAMES: Order Coleoptera, family Coccinellidae. Twospotted Lady Beetle--Adalia bipunctata. Ninespotted Lady Beetle-Coccinella novemnotata. Twicestabbed Lady Beetle-Chilocorus stigma. Convergent Lady Beetle--Hippodamia convergens. Ashygray Lady Beetle--Olla abdominalis. Asian Lady Beetle--Harmonia axyridis. SIZE: Adult--1/16" to 3/8", larva--1/2"
IDENTIFICATION: Adults are shiny round beetles with short legs and antennae. Heads are hidden beneath the front of the thorax. Adult beetles come in many colors--black, red, orange, yellow, or gray. Larvae are dark gray or black with yellow, orange, or white side markings. They look like small alligators with three pair of distinct legs. Short spines on each segment. Eggs are yellow ovals laid in clusters. BIOLOGY & LIFECYCLE: Complete metamorphosis. Development from egg to adult may take only two or three weeks. Adults can live from several weeks to months. Adults over-winter and lay eggs on tree bark, foliage, or stems in the early spring. Females lay from 200 to 1,000 eggs over a three-month period. Typically four larvae instars over a twenty-day period; travel as far as 40 feet in search of prey. 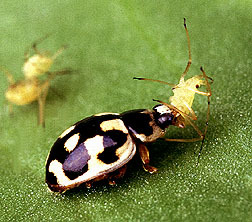 Last instar attaches to leaf and forms a pupa that is yellow-orange to black. Pupal stage lasts three to twelve days. HABITAT: Hedgerows, under leaf litter, under rocks, and in other protected places. Many vegetable and ornamental crops. Field crops and forests. FEEDING HABITS: Feed on aphids, mites, and other soft-bodied insect pests. Unfortunately, the imported Asian or harmonia lady beetles like the taste of ripe plums and peaches and will eat the fruit if something else provides an opening. ECONOMIC IMPORTANCE: Great control of aphids and other small troublesome insect pests. Can be stored in refrigerator for several weeks. Release about 1,500 beetles per 1,000 square feet in the home garden. NATURAL CONTROL: Very few enemies. They don't taste good. You don't believe it? Try one. ORGANIC CONTROL: None needed; should be encouraged. INSIGHT: Ladybugs are the most popular and most universally known of all the beneficial insects. There are several hundred species in North America, and all are beneficial. The most common native varieties are orange with black spots, gray with black spots, and black with two red spots. The black and gray varieties are arboreal and usually seen in trees. All ladybugs should be protected. The Hippodamia convergens--orange with black spots and converging white lines on the pronotum (shield behind the head)--is the most available commercially. For ladybugs to thrive and reproduce, they need flowering plants for a nectar and pollen source. Legumes such as peas, beans, clover, and alfalfa are especially good, but all flowering plants can help. Temporary artificial food can be made by diluting a little honey with a small amount of water and mixing in a little brewer's yeast or bee pollen. Smear small amounts of this mixture on small pieces of waxed paper and fasten these to plants. Replace these every five or six days or when they become moldy. Keep any extra food refrigerated between feedings. Discontinue when a ladybug population is established. Aphids are the ladybug's favorite real food. When using ladybugs indoors or in a greenhouse, screen off any openings to prevent their escape. 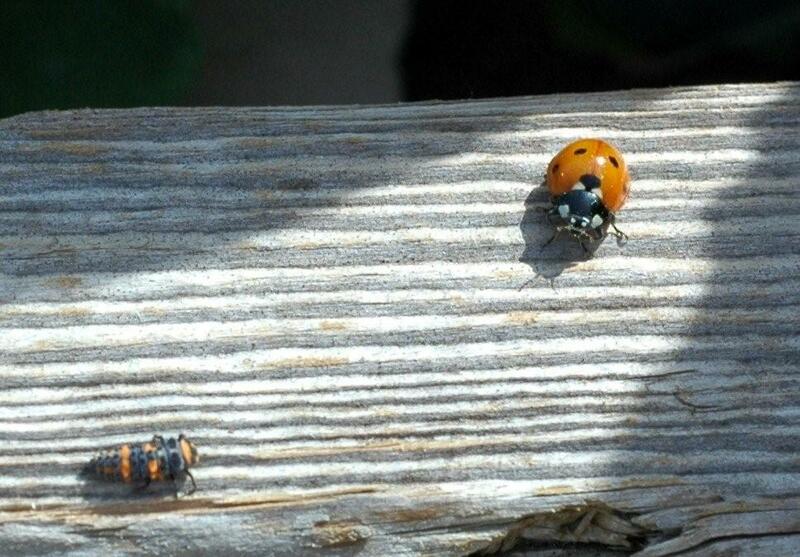 Congregating Harmonia ladybugs - considered a problem by some. If you have noticed a very colorful ladybug on your roses or goldenrod or even on the walls inside you house, congratulations--the Asian lady beetle has found you. Harmonia axyridis looks a lot like our native convergent lady beetle but has large white splotches on the sides of its pronotum instead of the converging white lines of our native. They will range in color from yellow or tan to orange and deep red. Some have many black spots, others have none. They also seem to be shinier than our natives. They are aggressive, do a great job of cleaning up troublesome pests, and have naturalized across Texas. If you find a large cluster of these pretty friends on the wall of your bedroom next winter, scoop 'em up and remove them to the garden. Ladybugs are highly beneficial in the garden, aphids are their favorite meal. Ladybugs can and do bite. I learned the hard way years ago doing what I thought was a clever shtick for a magazine shoot. Little tip for you. Bad idea to release a bag of ladybugs on your neck so they can easily crawl down inside your shirt. Tender neck skin is their favorite attack zone!. This information comes from the Dirt Doctor's Texas Bug Book, CLICK to purchase.